Offering you a complete choice of products which include Ladder Type Cable Trays such as Perforated Ladder Type Cable Trays and Perforated Ladder Cable Tray. We are instrumental in the manufacturing and supplying of optimum quality Ladder Cable Trays. These cable trays are precisely manufactured in our equipped infrastructure using latest technology and advanced machinery. Offered trays are useful in those areas where the change in wiring system is predicted. Our cable trays are widely appreciated among the clients for their hassle-free installation, seamless finish and corrosion resistance. 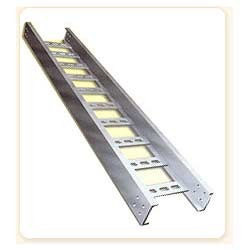 We are manufacturers of PerforatedLadderCableTray. These are painted cable trays and are powder coated. We manufacture these trays in compliance with the industry laid parameters and norms. Offered cable trays are appreciated among the clients for their smooth installation, fine finishing and corrosion resistance. Moreover, offered trays are available in various grades and dimensions. 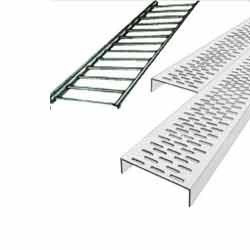 We offer optimum quality Perforated Ladder Type Cable Trays at affordable market price. These cable trays are easy to install and ideal to enter or exit the cables very smoothly. Moisture does not accumulate in ladder cable trays and can be piped into electrical equipment. In the manufacturing of these cable trays we use good quality metal that is sourced from trustworthy vendors. Moreover, we provide these cable trays in various grades and dimensions.